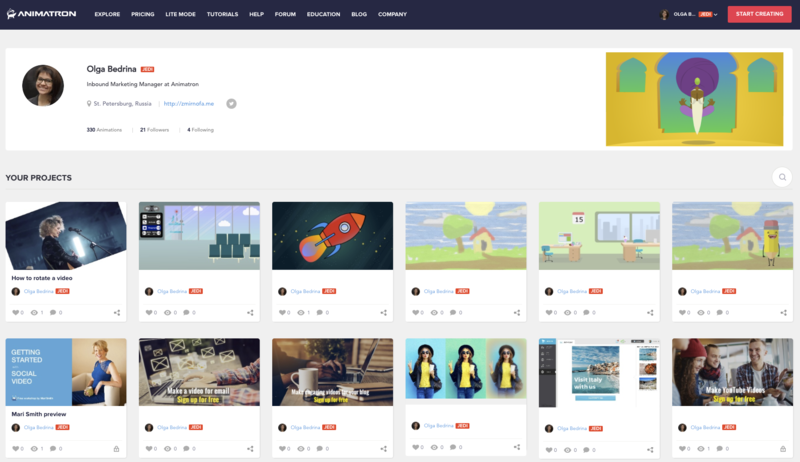 The "Account Gallery" refers to your own personal Animatron gallery of Projects, either directly created by you or duplicated from other Animatron Users. If a Project has been shared with you, and you continue to edit and/or change it in any way, this Project is automatically saved (as a new version) to your personal Account Gallery, making you its Project Owner. If you share one of your own Projects with another User, they will become that versions Owner and will not be able to edit your own Account’s version of the Project, unless you enable Modifiable in that Project’s Sharing & Privacy Settings. Note: Access your personal Account Gallery by simply clicking on your Username at the top of the Animatron Studio website. Here, you can personalize your Account information by clicking on the various sections of your Profile Cover or by directly accessing your Account Settings. Also, directly edit your individual Project's information by clicking on their Preview Thumbnails, shown above.